Nothing could be more natural than the mix of art and books. Both benefit, and the public is the biggest winner of all. Unfortunately the rarest and most beautiful of this partnership are kept safe from harmful light and the dirt and oils of human hands, often not even known of until an exhibit of gems of an era are put on special exhibit. While all of the names being shown in the third floor Cincinnati Room of the Main Library are familiar, their collaboration on the books shown are not. Exceptions are: the delicate little Songs of Innocence and of Experience: Showing the two contrary states of the Human Soul and Henri Matisse’s Jazz. Songs evokes a sense of preciousness, its verse not visible in the tiny format, but the message is illustrated by its envelopment in a charming frame of a lively blooming flower and its inevitable fate as it fades. For those who follow art, the bouncing solid color forms of Jazz are well-known and always welcome. Jazz was produced at the end of Matisse’s illustrious career when painting was no longer an option for the master. He began to paint, or have painted, solid colors and instructing aides in their positioning. The result is a joyful explosion of creativity needing nothing to explain it. While words could never completely explain this phenomenon, art accomplishes it handily. Music was again the subject in the book Yvette Guilbert, illustrated Toulouse Lautrec, one of her many devoted fans. Guilbert’s popularity was attributed to her ability to project a vision of chaste youth, while singing songs, often with her own lyrics, of “raunchy” language and double entendre. The artist produced a near catalog of, not only Guilbert’s career, but the whole Montmartre Belle Epoque era. Another of the joys of the good life was and is food, so what could be more appropriate than a book of menus, Onze Menus de Paul Gauguin complete with casual little drawings by Paul Gauguin, he of the South Sea paradise works. The page to which the book is opened features what appears to be some sort of joke about the local gendarmes, though Gauguin never seemed to have otherwise displayed much humor about anything. Away from the fun and humor, now comes Bible illustrated by Marc Chargall, a seriously beautiful publication of two volumes with 105 leaves of plates. Both volumes are shown in this collection with different illustrations opened. 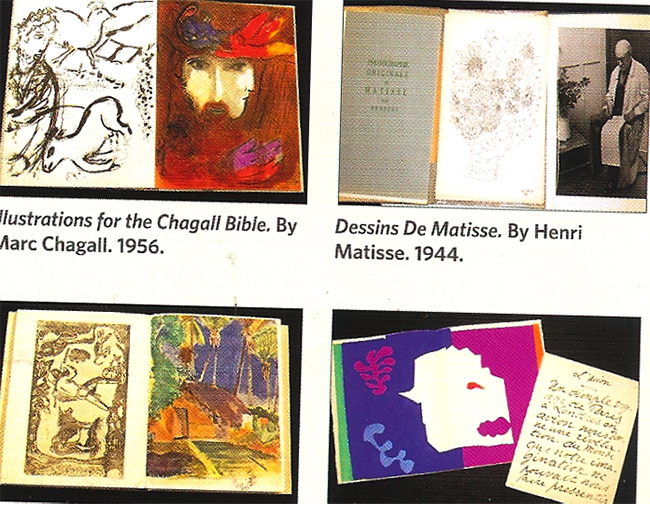 Their size and portfolio style, with removable pages of lush deckle edged paper, lift these to the museum quality so often approached by artists’ books. From the plate impressions visible, I assume these are etchings, and from the quality of these images, the intense labor involved is obvious. Gargantua was the stunner of the show. Its text was by Francois Rabelais and the artwork was by the Spanish artist, Antoni Cleve. The style of his illustrations, especially the faces on human forms was so like Picasso’s, that I had to look twice. Examine these closely, especially those facing the hallway of the 3rd floor bridge and you will find a connection that makes one curious. Of course, Picasso was never averse to “borrowing” from other artists. Historically, this show is a gem of the fin de siecle, both in text and illustration, from Joseph Pennell’s The Devils of Notre Dame , exquisite pen and ink views from a gargoyle’s perch high above Paris, through several books featuring Matisse as a portrait artist and as a draughtsman, Au Soleil Du Plafond, featuring the art of Juan Gris, and on to a peek into the lives of the upper classes in London in the early 19th century, The Microcosm of London, London in Miniature. Note cluttered salon-style display of paintings. This collection has been accrued through the generosity of the late Eda Kuhn Loeb, who left a bequest of $50,000.00 to the Public Library of Cincinnati and Hamilton County. The decision to purchase these remarkable books, has made Cincinnati a richer place to live. Don’t go away just yet. Take a few minutes and see what area artists are doing in the same genre today at Bookworks ’14 on the first floor of the library. These are the collector’s treasures of tomorrow.